One of our customers, Joel, has shared with us how he uses Swift To-Do List when searching for a job. I’ve been using Swift To-Do List recently when searching for a job, creating a separate database for only that and it’s been wonderful. It’s been making a lot of the processes I do much easier. Other people might be interested in a blog post from you illustrating ways in which that might be done since at least unemployment has been high in America. Thanks for making my job search an easier process. Joel has also sent us his workflow and a sample screenshot. I’ve been using Mozilla Thunderbird with its RSS feed reader to pull jobs over from different feeds that I have set up for different searches. When I pull jobs from an RSS feed and create a task in Swift To-Do List, I also place a link to the actual job posting site in the attachments of that task. That way, I have all the information for that listing that I can use later to follow up on if I choose to. The first list I named “To Do’s” for general tasks related to my job search. 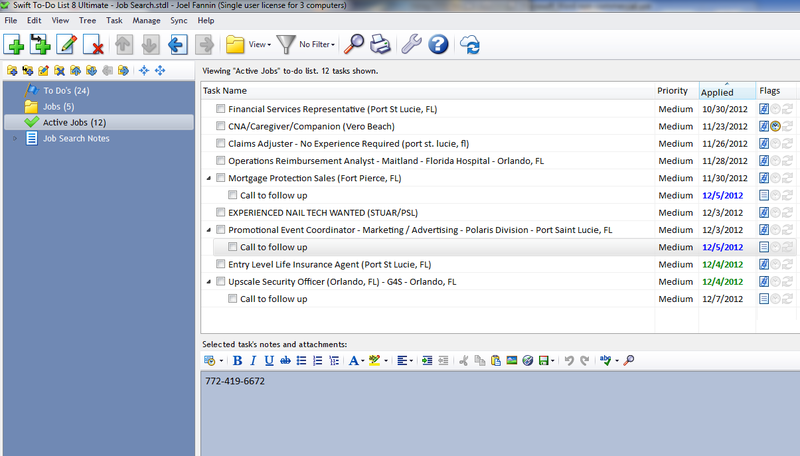 I add tasks related to websites I need to check out, unemployment comp, types of companies I need to research, etc. Another list I named ‘Jobs’ that I use to add any and every job that I find, regardless as to whether I pulled it from one of my RSS feed searches or manually added it from the Internet or paper. This “jobs bin” is a collection of all that I find. The third list is called “Active Jobs” and is the “bin” where I place jobs that I’ve culled from the Jobs list that I’ve reviewed and truly interested in. The jobs in this list are jobs that I’ve responded to, letting me easily track the jobs and follow up with them. If I get a call for an interview, I can easily add a subtask with the interview date to that job. In Swift To-Do List, you can easily Drag and Drop tasks from one list to another. In this case, you can easily Drag and Drop tasks from the “Jobs” list to the “Active Jobs” list. I also renamed the “Start Date” column to “Applied”, to indicate when I applied to a position. It tells me when I initially applied for a job in this list. When I haven‟t heard back from a job I have listed in the “Active Jobs” list that I‟ve applied to, I checkmark it, it grays out and falls to the bottom of the list – convenient and simple. If I‟m not concerned with my application history, I have the choice to archive those or all jobs. In this manner, jobs come in, get processed, and exit the system. After this, I have a section for all job search related notes so this allows me to place my complete job search within one system – Swift To Do List. Being able to Drag and Drop RSS feeds posts and emails into Swift To-Do List, add notes, reminders and subtasks – has really made this a powerhouse for job searching and has saved me time. If anyone else has any ideas about ways that this organization in Swift To Do List could be improved or perhaps your own system, share with us. Yes, using lists is almost always good way to prevent negative emotions. I think this is because writing things down puts you in a “higher”, rational place, where you can think more clearly.